Note: This article can be found in the back of the author's book Whole-Foods Plant-Based Diet. 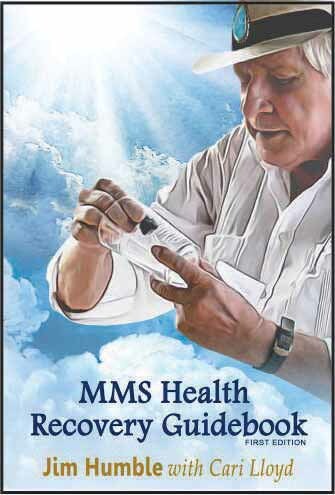 MMS or chlorine dioxide was discovered to be a miraculous healing agent by Jim Humble - buy his book. Jim doesn’t sell MMS he only discovered it. MMS (Master Mineral Solution) is dirt cheap, commonly available and, because it is a long existing substance (over 100 years), it can’t be patented. For this reason, no trials will be done and no pharmaceutical company will ever sell it. The drug companies look at it as competition. If only a sliver of what people are reporting anecdotally is true, then MMS would pose a catastrophic threat to the profits of the pharmaceutical companies. Before we go any farther, the author needs to say this: The author offers this information regarding MMS for experimental and academic purposes only. He is not a medical doctor and makes no claims as to the efficacy of MMS. The reader should consult a physician before using any substance that has not been approved by the FDA. Go to Jim Humble's website to see more information: www.jimhumble.is. Here is a good independent short article explaining the basics. Go to YouTube and do a search for "MMS testimonials." Here is a large collection of YouTube testimonials: MMS Testimonials. There are pages and pages of people reporting their cures from cancer to diabetes to infections, to hepatitis to AIDS to arthritis and so many other maladies. Also go to this page which has many written testimonials catagorized by the illness cured. Jim Humble reports that MMS will cure 95% of all cancers. Lindsey Wagner - TV's Bionic Woman - tells how MMS provided her with a cure - a 4 minute clip. The author personally has a friend who cured his AIDS with MMS with his viral count going to zero in 2.5 weeks at which point they pronounced his AIDS as undetectable. Also he has another friend who cured his antibiotic-resistant flesh-eating staph infection in only 3 days of taking MMS. The doctors wanted to scoop out a big hunk of flesh surgically in an attempt to stop it but the friend was spared this by simply taking MMS. Look for testimonials on YouTube by searching for "MMS testimonials." Many people are even curing the autism of their children with MMS. One woman who did so wrote a book and is helping others do the same and here is her website ("CD" stands for chlorine dioxide which is MMS). You can also listen to people talking about this on YouTube - do a search for "MMS autism." Buy Jim Humble’s book from his website at MMS Health Recovery Guidebook. This is an updated version of his previous book The Master Mineral Solution of the Third Millenium. Buy both books. The print version of the older book is no longer available but can be purchased as an ebook. An advantage to this older ebook is the ability to search for keywords such as tuberculosis. The new book has much information that is not in the older book. The older book tells the story of MMS and Jim's travails like being put in jail in Africa, harrassment from the medical establishment, how it was discovered and developed and so on. Also in the back of the older book is a detailed explanation of the chemistry of MMS and how it works in the body and why it works so well without harming our natural body cells. This all has to do with the difference of the electrical charge on pathogens (bacterium, viruses, parasites) and the cells in our bodies and the fact that the pathogens are anaerobic (are killed by oxygen which is delivered by the MMS) while our own cells are the opposite - aerobic or oxygen friendly. You can also got to Jim's website to buy Jim's book as well as find much useful information about MMS. Here is one of a number of websites that sell MMS but as a water purifier that you might take camping or to a foreign country where the water might be suspect. The FDA is so red-hot about this the sellers have to be very careful. We can’t even imagine how much this would cost the drug companies. Many have accused the FDA of representing the interests of Big Pharma instead of common folks. $30+ with shipping. 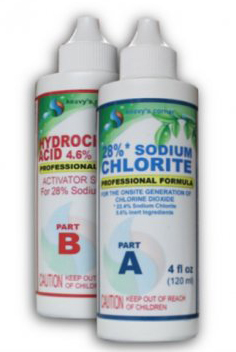 It comes in two bottles one with 28% sodium chlorite solution and one with a 50% citric acid solution. You mix them together in equal parts to make MMS. It is easy to make your own solutions and there are people on YouTube showing you how. If you made your own, it would be dog dirt cheap. If you google MMS you will find one or two sites that are very negative about MMS calling it a toxic poison and pointing out over and over that it is a bleach and causes vomiting and diarrhea. This is all propaganda. Recently, in 2015, the FDA had to issue a letter saying they have no proof as to their alleged toxicity of MMS. Go to www.infomms.org/fda.html or Google “genesis II fda no proof mms”. You will also see a copy of the letter from the FDA stating that they have no proof to substantiate their claims. The Wikipedia account is wholly bogus. Jim Humble and his associates used to post the truth but the next day the lies would be back. If you investigate the references to clinical studies, appearing in fine print at the bottom of the page, you will see that they have nothing to do with MMS. It's a point-blank, bald-faced scam. The authors of the Wikipedia page are correctly assuming most people will not bother to actually read the studies. For example, the first study referenced says sodium chlorite, a component of MMS, causes acute kidney failure. First of all, we are not taking sodium chlorite. 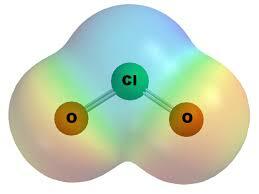 We mix sodium chlorite with citric acid which then becomes chlorine dioxide and that is MMS. This is like saying table salt will cause death if consumed because it contains sodium which is a component of table salt (sodium chloride)! Sodium taken by itself would be very poisonous but is harmless when combined with chlorine (another very toxic element) to make table salt. The Wikipedia text leads us to believe a clinical study had shown that sodium chlorite will cause kidney failure (which is in no way MMS any more than sodium or chlorine are table salt – sodium chloride). In reality the report is a news article about one man in China who took a gram of sodium chlorite in an attempt to commit suicide. A gram would be thousands of times more than the dose we would take IF it was sodium chlorite we were taking which it IS NOT. MMS is a non-toxic ionic form of chlorine dioxide – ClO2 - and is taken in very tiny amounts. This is the kind of deceptive reporting that is on the Wikipedia site. Most people read the short blip in the article without investigating the source and conclude MMS causes kidney failure. No - a massive amount of sodium chlorite caused kidney failure in one man (not a clinic study) in China. Yes, it will bleach but so will hydrogen peroxide which is given to people intravenously. Both MMS and hydrogen peroxide are oxidizing bleaches unlike Clorox which is a chlorine bleach. Even Clorox is used to disinfect drinking water. Chlorine is toxic while MMS is not. The sun is also a bleach. If you take too much MMS you will get diarrhea but the same will happen if you take too much vitamin C. The dose we take is very small. Out of 10 million people using MMS, no one has ever died using it. There are no reports of anyone being injured by it. In contrast, prescription drugs prescribed by doctors are the number 4 killer in the USA after heart attacks, strokes and cancer. This was reported in the Journal of the American Medical Association. Buy Jim Humble’s book MMS Health Recovery Guidebook. There is a great documentary called Understanding MMS by Adam Abraham but it takes little luck and good timing to find it. The website of the maker of the film doesn’t have a trace of it. The author emailed Mr. Abraham at his website which is www.phaelosopher.com and inquired about purchasing the DVD but got no response. It is highly likely he has been threatened regarding his documentary. This is an update: For several months now, the DVD has consistently been available on ebay. If you want a copy, it is a good idea to buy one now before it disappears again. Since we first posted this page, the documentary Underestanding MMS has become available on YouTube for free. This is 1 hour 45 minutes in length and well worth watching. In the following video, Dr. Andreas Kalcker talks about MMS, what it is and how effective it is for a list of maladies. 23 minutes. The main promoter of MMS, Jim Humble, had to move to Costa Rica to avoid the FDA. He set up a church called Genesis II to dispense information about MMS as another tack to avoid the FDA. He has since amicably parted ways with the church which is managed by someone else and is still a good source of information. Jim is an elderly man and is independently wealthy from owning silver and gold mines in South America which is where he discovered the power of MMS by curing all cases of malaria among the workers. As of October, 2017, Jim Humble, who is 85 at the time of this writing, is retiring from the Genesis Church which will be run by Marc Grenon. Jim has other projects he is pursuing with MMS. Jim's new website is www.jimhumble.is.